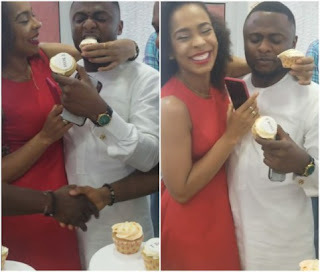 Just over this weekend there was a report that Tboss could be dating music mogul and father of one, Ubi Franklin as photos of them snuggling surfaced on the internet. The former Big Brother Naija housemate has however opened up that she is not dating anyone in the entertainment industry. I was born in Bucharest, Romania, to a Romanian mother and a Nigerian father, who hails from Edo State. I have three siblings. My father was an engineer and he was always moving from one state to another. Whenever there was a need to move, we had no choice but to go with him. Though it was fun, the whole process of changing homes, schools and friends was quite hectic. We, however, adjusted easily. I was a very shy kid and a rebel, while my younger sister was an outgoing type. Looking back, I will say that my childhood was quite interesting. There were some ugly days, but I still had fun growing up. I went to primary school in Suleja, Niger State. For my post-elementary education, I attended Federal Government Girls’ College, Calabar. I started a diploma programme in law, but later got a scholarship to study Political Science in Romania. I graduated with a First Class degree. I will not say I was the smartest, but I was very determined. I had a lecturer who was racially prejudiced and he always made sure foreign students failed. This made it mandatory for me to do very well in my studies because I wanted to shame him. I am not under any sort of pressure. I have always done things at my own pace, which is just fine by me. When it comes to criticism, assumption is the cheapest form of information. People will always have an opinion about everything and I’m not in the business of trying to convince people to think or say otherwise. I got some endorsements and movie roles last year. I plan to do more movies this year, but I don’t want to reveal too much at the moment. I like to keep certain things private and my love life or relationship falls into that category. However, the story that I am engaged to a musician or anyone else for that matter is just a rumour. I am not engaged to be married to anybody and if such happens, everyone will know. At present, I am only focused on my brand and how to make it better.